GTA Online Shark Card guide – which card gives the best value, and what can you buy with it? 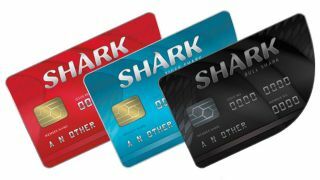 The premium currency of GTA Online is “Shark Cards”, which are essentially a way to continually monetise the game by allowing players to buy virtual money with real world funds. Since GTA Online began in 2013 the cost and amount of vehicles, guns, and other items in the game has increased substantially, but the value of Shark Cards has not seen any change - they are the same price today as they were 5 years ago. In this article we’ll take a look at all the Shark Cards you could buy, how much they cost, and what you could buy in game for your money, as well as showing you the best current deals online. This shark card offers you the worst value by far, costing over double what you’d pay for the same amount of in game money if you bought a more expensive card. And it won’t buy you much these days either - at least nothing that’s been added to the game in the last 3 or 4 years. You might be able to combine it with some of your own funds to buy some older weapons, or sports cars that have been around since the games release, but prices of DLC cars quickly started to increase after those early days. Everything that was said about the Red Shark card can be said about the Tiger Shark card too. You save a little more money compared to buying two Reds, but in reality there’s not much you can buy with this either. Half a million GTA dollars is not something to be sniffed at, and you can certainly buy a large number of vehicles for that price. Nothing top end of course, and you won’t be able to buy multiple of them, but if there’s a single car you’re craving that isn’t too expensive this can cover the cost. Whether it’s worth 10 bucks though is something for you to decide. A lot of high end supercars and sports cars in GTA fall into the “just over a million dollars” range, so if you feel that one of those is worth 15 bucks this is the card for you. There is a big value shift here too in comparison to the 3 cheaper cards. More bang for your buck. You’re only saving a few dollars by going for the Whale Shark card instead of 3 Great White Shark cards, and you’ll be able to buy a decent amount of vehicles or a smaller number of properties, but at this point these start to become serious purchases. Since it’s been out for 5 years now, the GTA 5 base game costs less to buy brand new than this add on cash card. Something to keep in mind. The whopping 8 million GTA dollar Megalodon Shark Card easily offers the best value for money, although that’s not exactly saying much. There are a number of in game vehicles that cost upwards of 4 million each, such as the new Scramjet supercar ($4.5m), Deluxo flying car ($4.7m), Swift Deluxe helicopter ($5.2m), and P-996 Lazer fighter jet ($6.5m), so if you’re wanting two of these you’ll not get both for 100 bucks. There are even items that cost more than the 8 million you get from this card, such as the Luxor Deluxe plane ($10m). You would be severely mistaken for thinking that pulling the trigger on this “greater than the cost of a brand new game” ‘micro’transaction will allow you to purchase everything you want. If anything it will just make you realise how much more you’d have to spend. So, if the Megalodon Shark Card offers the best value for money and it comes out to an approximate cost of £8.12 / $12.49 / €9.31 for every $1 million of in game funds, how much would it cost to own everything? As you might expect, that number is almost sickeningly large. This article’s author made some calculations during research made while creating this video, which talks about the most expensive items in GTA Online and the results are pretty staggering. To simply own one of every single vehicle in the game that it’s possible for you to store on your character, not taking into account property costs, weapons, vehicle upgrades, clothes, or anything else that costs money to acquire, would set you back somewhere in the region of £3,000 / $4,500 / €3,500. You can find a detailed breakdown of this here. And with the reported profits of Rockstar & Take-Two over the last 5 years, it’s not difficult to assume a significant portion of the playerbase have spent just that, if not more.